Ben 10 Galactic Racing, Rocksmith, and Naruto Shippuden: Ultimate Ninja Impact! Halloween is only a couple of weeks away, do you have your costume picked out and ready? If not, perhaps you can get some ideas from the games coming out this week. Today, we're previewing Ben 10 Galactic Racing, Rocksmith, and Naruto Shippuden: Ultimate Ninja Impact! 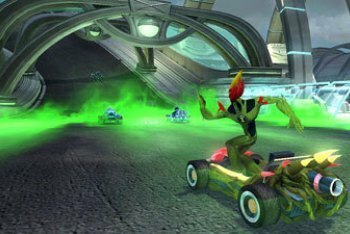 As the name implies, Ben 10 Galactic Racing is a racing game set in the Ben 10 universe. This is the first Ben 10 themed racing game and it is quite similar to other kart racing games. The twist is, of course, that each of the fifteen characters has unique special abilities. 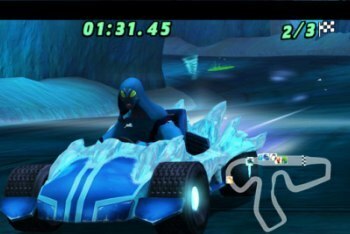 For example, Ben can enable different alien forms during the race. There are offensive and defensive abilities that you can use and even an ultimate move! Included in the game is a brand new alien, Fasttrak. Rocksmith is a new rhythm game that is designed to teach you how to play a real guitar. You can take practically any electric guitar and plug it into the game and play! This means that you can later on take that same guitar and plug it into an amp and impress your friends with all the cool songs that you know. Included in Rocksmith are several mini-games that help you learn the basics of the guitar, such as "Ducks" which gets you to shoot ducks while learning fret placement and "Dawn of the Chordead" that teaches you chords. The Naruto Shippuden: Ultimate Ninja series continues with Impact, the sixth game in the series. This game covers the Kazekage Rescue story arc up to the Five Kage Summit story arc. Along with all the usual fighting and boss modes, there is an all new rush battle system and 1 vs. 100 battles. The game features over 50 playable characters.